A Study in Healthcare Terminology - Part 2 | Language Solutions Inc. In preparation of the new Open Enrollment season, we looked at the state of healthcare terminology for the Hispanic population in more detail as healthcare translations are one of our main areas of expertise. In researching 6 major organizations, both government and private, it can be confirmed that Healthcare Terminology is vastly complex and not always very consistent among different government and private organizations. Part 1 discussed the glossaries we researched. This is part 2 of our series on Healthcare Terminology for Healthcare Translations. The Healthcare Industry by nature complicates the process of unification of healthcare terminology. There are various mandates under Federal and State law that determine language access needs for individual health plans. Any Plan that receives Federal funding such as Medicare and Medicaid plans are obligated to provide language access for members if they reach a certain threshold of foreign language speaking members. Any insurance plan or product that is sold in a state goes through the State Insurance Department where it is sold, each with their own standards on how translated materials are reviewed and approved. This variability makes it difficult to find one single authority on healthcare terminology, much less standards in translation, in Spanish. We’ll address the accessibility first before we go into variability in part 3. The decentralized approach to Healthcare Translations has resulted in glossaries that were translated by different organizations. Glossaries like those from CMS and Medicare come from translation firms with GSA contracts. These contracts are regularly up for bid and may be done by different translation firms without the benefit of a shared Translation Memory. AFLAC has a long history in translation and one of our own regular healthcare Spanish translators worked with them in the 1990’s as they were standardizing their Spanish healthcare translations to be compliant with each State department. They worked with individual translators. 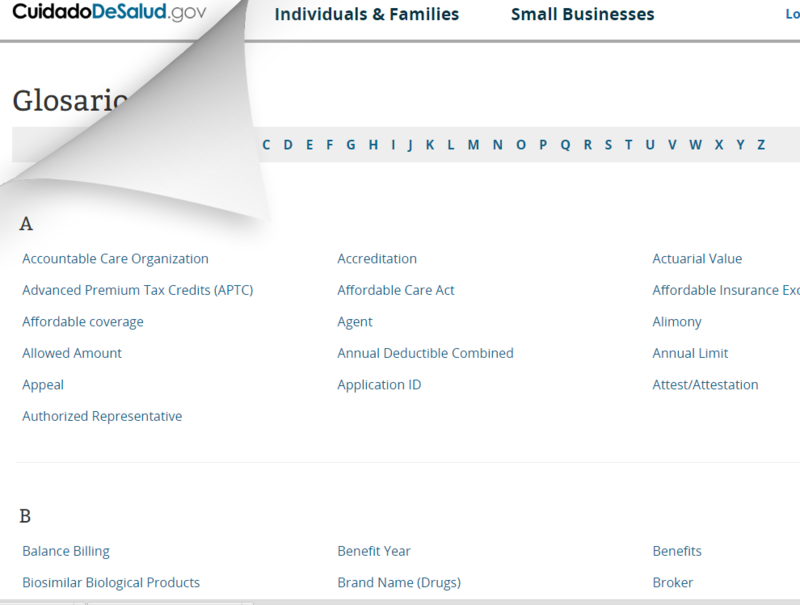 The ACA site healthcare.gov, criticized initially for the poor Spanish translations it provided, seems to have glossaries that are quite complete today. We’ll comment further down on the variability of terminology, but what’s clear is that while insurance terminology and program terminology seem to be fairly consistent in English, there are several Spanish translations available for the same term in English through the organizations we researched. The accessibility and usefulness of the glossaries produced by these organizations varies, but none are really productive tools that can be used effectively without having it available in a bilingual format. This creates a barrier for the industry to provide the public with Spanish translations that are consistent. In order to make an assessment of these glossaries, we created our own assets out of these terminology databases by manually aligning these in bilingual format, so that we can access it using our Translation Memory and Termbase Technology. We then reviewed it all with our regular healthcare Spanish teams, made final decisions on terms and finalized a working terminology database. To align, correct and review these Termbases took quite a bit of time investment. We decided on doing this because Healthcare translations are one of our main verticals and it is an asset that we can use on those client healthcare translations. 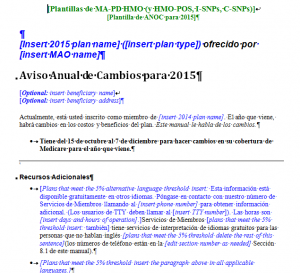 CMS provides Model Document Templates in Spanish. These documents would need to be recreated to match the English documents. Usefulness is an issue as well with the Model Documents that CMS puts out for health plans. CMS makes the translations available so as to relieve health plans of some of the burden of costs. While the Spanish translations are available for use, the documents are far from completed. Plans still need to add in their own information in English and in Spanish and manually assess whether these documents are consistent. The example in Word on the right is an example of the amount of data and information that needs to be added into the Spanish document. Having to do this both in English and Spanish is a lot of double work, and is more prone to errors as it is a manual process currently for health plans. 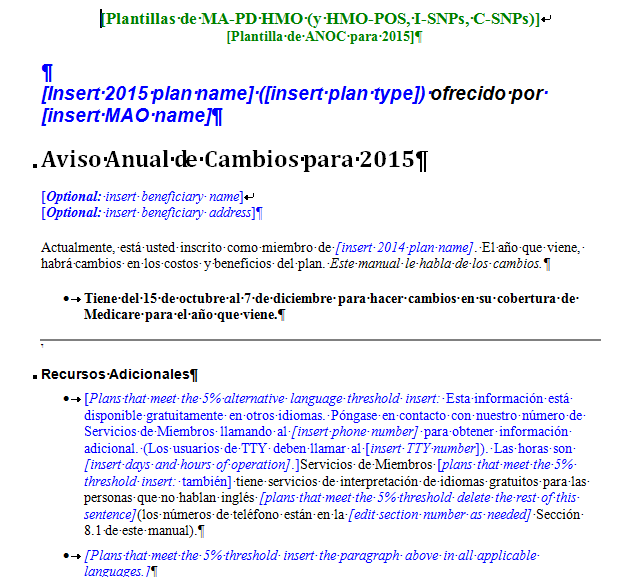 It would be much more productive for Health Plans if these CMS Model Documents were available in a Translation Memory or even in Excel so that once the English document is created and approved, the health plan’s language service provider could then use their Translation Memory Technology to complete the Spanish. Translation Memory allows us to use technology and apply existing translation to parts of the document that match what is in the Translation Memory (you can read more about this technology here). See the example below where not only are we making use of the Translation Memory created from our alignment of Model Document templates, but also incorporating our Termbase on the top right hand side to automatically look up any approved terminology. Using Translation Memory and Termbase Technology to assist in consistent and productive healthcare translations. By bringing these glossaries together, we get an idea of the consistency and quality of the information in Spanish that is being produced by these major healthcare organizations. Our work of harvesting existing translations and terminology produced a total of 775 English and Spanish terms that came from these glossaries and we compared these against our own glossaries and our industry knowledge. We can conclude that quite a lot of the basic language is well covered. Terms like network (RED), claim (RECLAMACIÓN), cost sharing (COSTO COMPARTIDO) and deductible are all in agreement. Coinsurance is is either coseguro or coaseguro and both are correct, but we prefer coseguro. Continue reading in part 3 where we delve further into the inconsistencies found in healthcare terminology.